Salerno Gallery is currently accepting 2015 proposals for our G.P.R project/hire space in Glebe. If you’re an artist or curator looking to exhibit any form of artistic work please feel free to contact us for an information pack. Salerno Gallery offers artists a dedicated versatile and unique exhibition space named G.P.R. Situated in the bustling inner-city Sydney suburb of Glebe, Salerno Gallery’s G.P.R exhibition space takes full advantage of it’s prime street frontage on Glebe Point Road via three large windows offering 24 hour exposure to the high volume of foot and car traffic that pass every day of the week. The flexibility and physical location of the exhibition space allows solo and/or group shows (working with all artistic mediums) to exhibit their work publicly, gain wider exposure and to generate sales and commissions to sustain their art practice. Above all we are keen to encourage artists to be ambitious in their practice and use the space to try out new ideas. 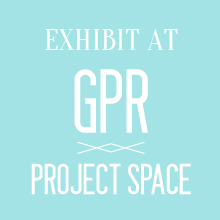 If you’re interested in exhibiting at G.P.R, please contact us for an information pack and/or fill out and return the application form situated to the right.